Eat-in kitchens are essentially convenient for people who are always on-the-go in the morning. It is usually a tiny place by the kitchen where we quickly eat bread and drink coffee before we head out from home. But if you’re a mom or someone who cooks, who thinks countertops has tons of bacteria, we would prefer adding a small table and chair on the side for cutting stuff as we prepare to cook. In our own home, we make sure our kitchen activities are separated from the dining or the living room, especially when we have visitors; because whether we like it or not, we mess up the kitchen more than we can handle. Kitchen is the heart of the home, unless you have hypersomnia who prefer sleeping than eating! 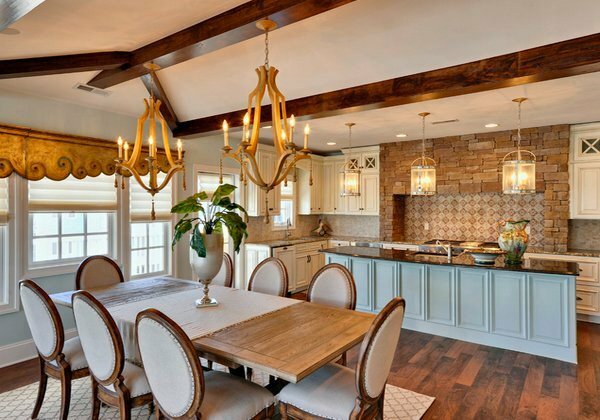 Today, we will be showing you 15 Traditional Style Eat-in Kitchen Designs that will make you consider cleaning up your kitchen and make ones like these, take a look. A spacious kitchen with wood being the primary material – from the ceiling to the wall, from the cabinets and drawers to the eat-in counters and the cute wooden bar stools. 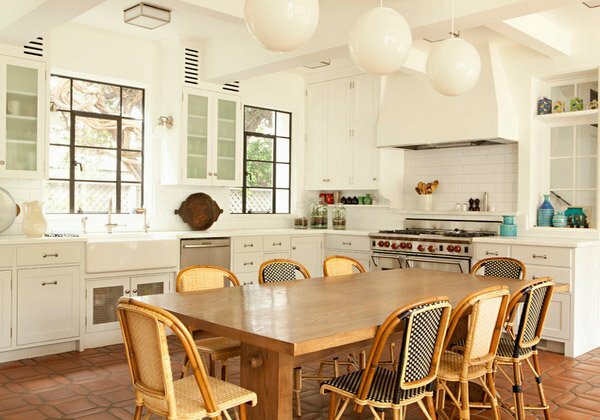 Spanish colonial in design, this Los Angeles home has another dining table inside the kitchen aside from the dining room. 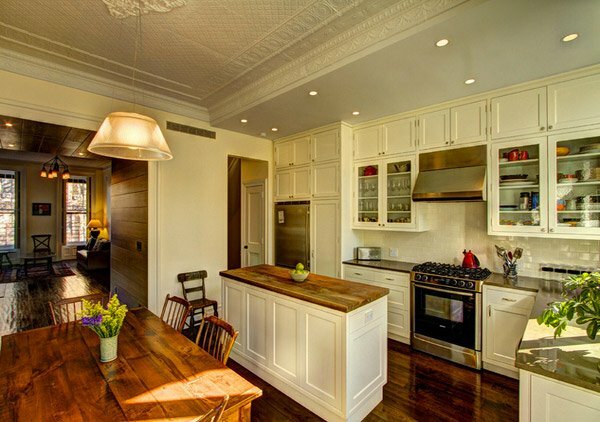 As awesome as this kitchen space is, we can’t help but notice the wooden valance by the window created for the owners! This home is really pretty and very functional. 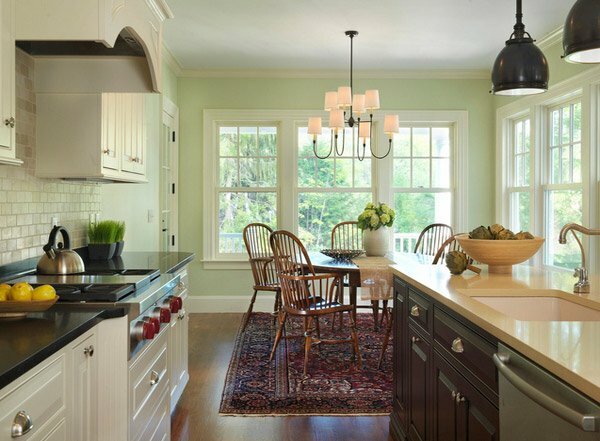 The black pendant lights may be the highlight for this kitchen because aside from the black counters, everything close to it is light in color like beige or white or a dash of green. The 5-seater dining table on the side sure brings back family memories. The family of six wanted an eat-in kitchen where they could gather for meals, so Sigurdsson created this high-top table/kitchen island. “This is a huge family center point which truly serves as the heart of the home,” he says. Aside from the bar stools by the kitchen counter, we have a small dining set on the side for additional people who prefer to eat their meals in the kitchen rather than in the dining room! Unique blend of paint colors, stain detail, oversized crown molding detail lends itself to a partnership between traditional elegance and rustic warmth. 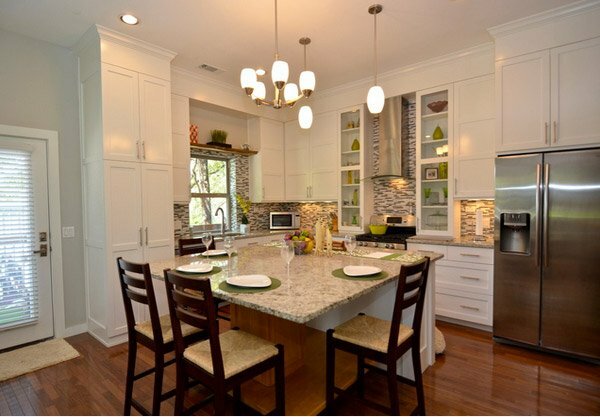 Eat-in kitchens and breakfast nooks allowed families to gather in the space at any time of day. 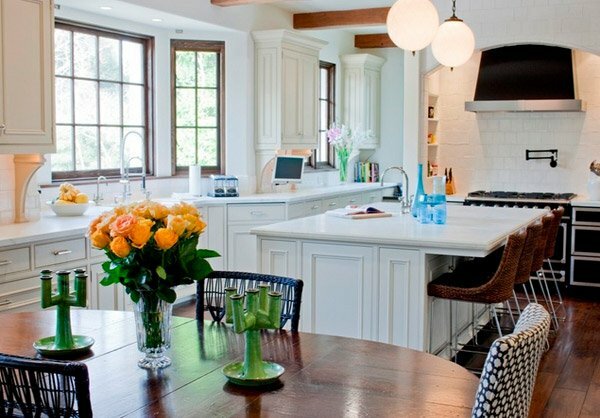 This maybe the most comfortable eat-in kitchen we have for this list! They have a pretty little couch paired with two other chairs for comfy eating and hanging out in the kitchen! This beautiful kitchen came out real pretty when the clients saw it for the first time. One of the few things they liked was the counter which had an overhang for the bar stools to be inserted when not in use. It made sitting there more comfortable than usual. This home is created with decorative ceilings which makes people wonderful by looking up at it. 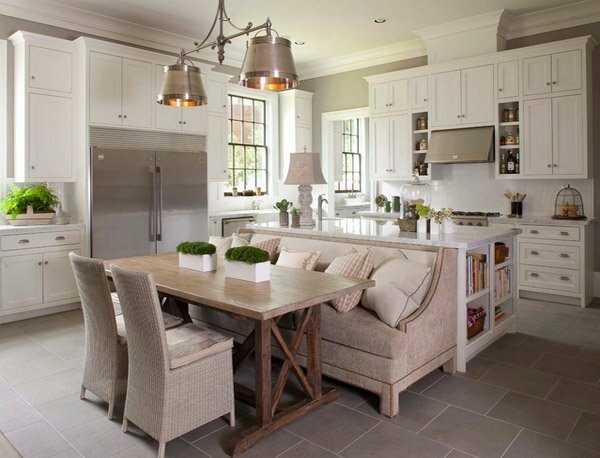 This farmhouse kitchen is definitely lovely and homey all at the same time. 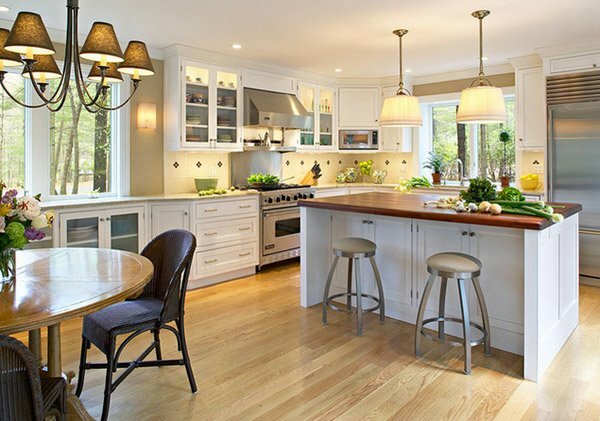 Wooden floors, wooden table and wooden countertop make this eat-in kitchen a real catch! 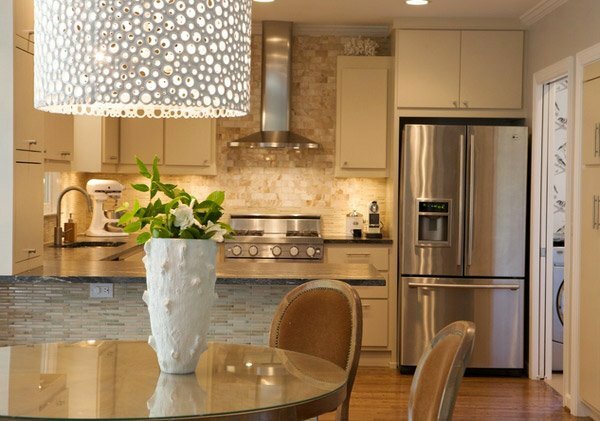 Eclectic as it is, this Raleigh kitchen showcase glamour and beauty. Lovely bullet tile design with classy cabinets and decor, not to mention the wood trim for the upholstered dining chair for the eat-in area. 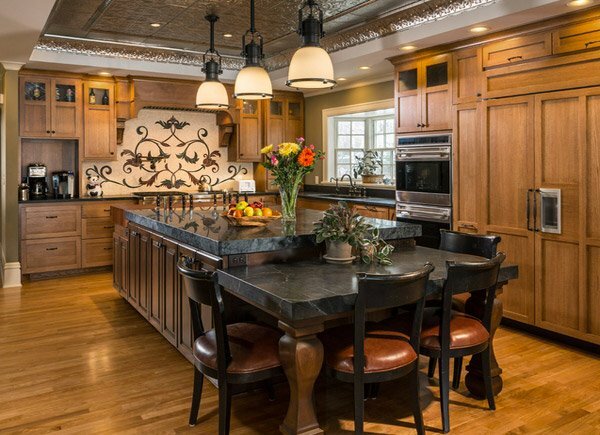 Open kitchen floor plan with seating around a large soapstone island. Custom designed mosaic tile behind the stovetop and custom designed tin ceiling. A minimalist kitchen showcase a Scandinavian and rustic feel and still complements a rustic and traditional kitchen space. 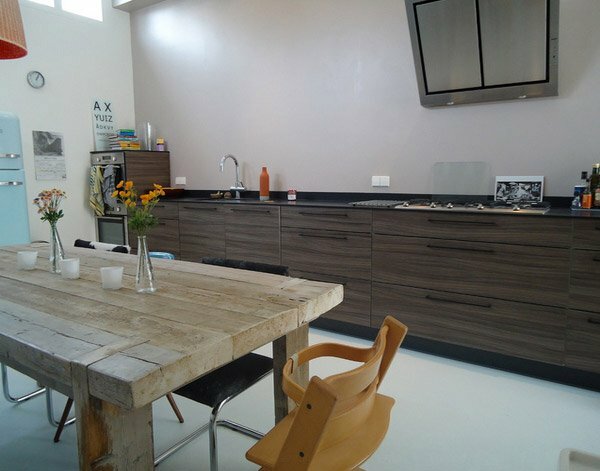 A brightly lit Amsterdam kitchen that show us another comfy eat-in kitchen! The place is oh-so-white, so we have to be careful with messing up things here! A lovely kitchen all in all. 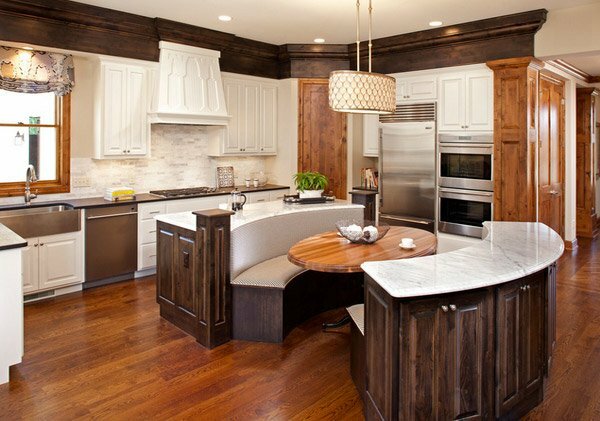 The 15 Traditional Style Eat-in Kitchen Designs that we have created today is a follow up list for the list we made for you yesterday. 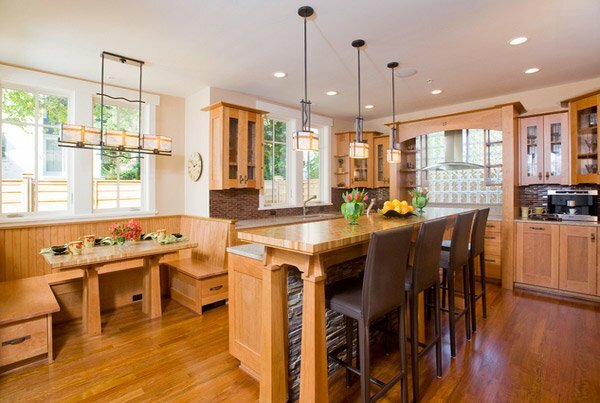 We showcased 15 Modern Eat-in Kitchen Designs which is the counterpart of the traditional ones we have listed today! Like we said above, the kitchen is the heart of any homes which makes it the center of most activities we have for the entire day – sometimes having an eat-in kitchen is the best way for us to save, cook and do reading or other work we can do away in the living room. As for moms out there who prepared meals almost every two or three hours every day, these ideas are for you!